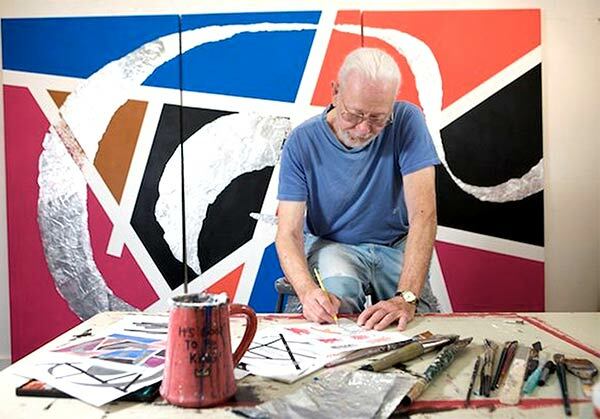 Murry Handler is exhibited nationally in both solo and group shows. His work appears in national and international juried competitions. His work is in private and corporate collections around the country and is being noticed and collected in Europe and Scandinavia. He has been invited to participate at Art Point-Gumo, Macedonia, Galariazero, Fuzhou, China and in Galariazero, Barcelona, Spain. Handler’s creative output has an exceptionally diverse range. Recognized primarily by his gestural abstract paintings executed with dynamic sweeping brushstrokes in acrylic on canvas, he also produces delicate filmy figural works on paper. His watercolors are conveyed in a brilliant palette, resulting in playful, spontaneous abstractions while large canvases are often swirls of stark black and white images. Inherent in all his work is a strong sense of vibrant movement. Mr. Handler’s painting has evolved from tight realism to flowing, turbulent expressionistic pieces. His ink paintings, available in limited edition prints, are executed with a bold black line on paper and canvas. They are highly suggestive of figurative art and influenced by Chinese calligraphy. A native of Bangor, Me., Murry Handler settled in New York City as an art student eventually achieving a career as an award-winning illustrator and designer while continuing to pursue his fine art. He studied at The Franklin Institute of Art, figure drawing with Joseph Kelly at Pratt Institute and painting at the Workshop School, under the late Joe Hirsh. His teaching credits include The Fashion Institute of Technology and Parsons School of Design, both in NYC. Currently he works from his Pittsboro, NC studio, where his creative activities include painting, creative writing and the art of Bonsai. Murry is represented by FRANK Gallery in Chapel Hill, NC. He is a member of the following arts groups: Society of Illustrators, NYC; FRANK Artists Collaborative, Chapel Hill, NC; Allied Artists of America, NYC; and The Durham Art Guild, Durham, NC.